You can download your entire album collection or just part of your collection to a PDF file. The Print to PDF screen offers a wide variety of options to customize your PDF file completely. For example, you can if you want, export only a selection of your albums (for instance, just your wish list), and only export the Title and Genre fields for each album and in your preferred set sort order too. Want to include an image? That’s possible too! Maybe you just want to print out a small selection of your albums to PDF. Maybe just your albums with their format set to “Vinyl”. In that case, you need to make a selection of albums first and then go to the Print to PDF screen. To begin, you need to select the albums you want to send to the PDF file. To select albums, click the checkboxes on the left of each album entry in the list. Checkboxes are also available in Card View and Images View, just hover your mouse over an album. 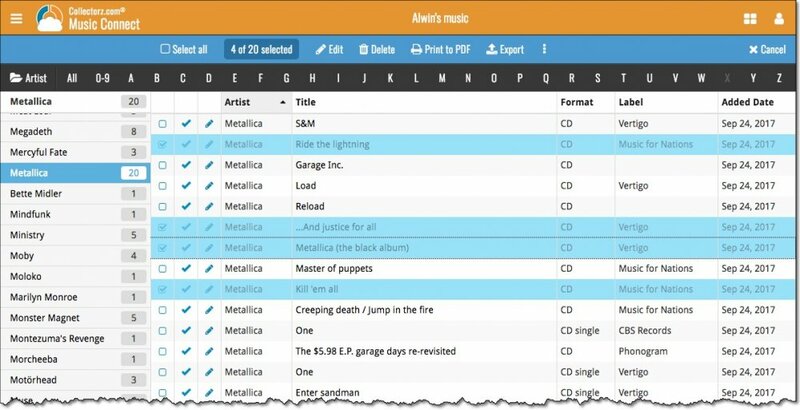 Set up your document with the columns and sorting options you wish to use and finally use the “Generate PDF File” at the bottom to create your PDF file with just the selection of albums you made.